Defense Ministry Director-General Udi Shani signed an agreement during a ceremony in New York on Thursday, according to which Israel will purchase the first squadron of F-35 stealth fighter jets from the US for $2.75 billion. "This is a significant day for maintaining Israel's military superiority in the region, which will help us cope with challenges both near and far," Shani said to Ynet. "I am also happy that we managed to bring significant sums of money to Israeli industries, which will help in continued economic growth." The American side was represented by Deputy Under Secretary of the Air Force, International Affairs, Heidi Honecker Grant, and Vice Admiral David Venlet, head of the Pentagon's F-35 program. The signing comes after the Israeli government, Knesset and security establishment gave their approval for the agreement. "This is an historic event and a new era in the State of Israel's security and strategic strength, maintaining Israel's qualitative military advantage in the face of nearby and distant challenges for many years," the director-general said, emphasizing the "enormous importance to the national economy" of commitments worth billions of dollars to purchase from Israeli industries. He also said Israel intends to purchase further aircraft, noting that the agreement is another expression of the strategic alliance and friendly relations between Israel and the US. 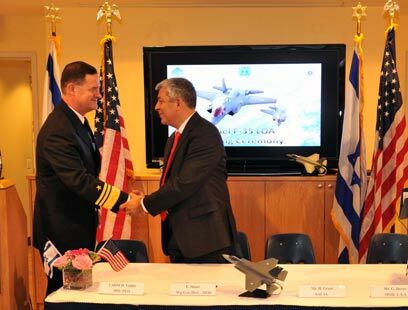 The agreement was signed after a number of years of contacts between Israel's defense establishment and the US Defense Department, and after agreements were reached about price, the integration of Israeli industries in the production process of all F-35 planes, and the integration of Israeli capabilities in the aircraft Israel will purchase. According to the agreement, Israel will receive the first aircraft between 2015 and 2017 at a price of $96 million per plane, together with simulators and spare parts, at a total price of $2.75 billion. See all talkbacks "Israel signs agreement to buy F-35 jets from US"